Workforce Solutions prepares job seekers to be competitive in the job market. Whether it’s a first job or a mid-level career change, Workforce Solutions helps over 10,000 people a year gain skills for careers they are proud of and that support their families. Job seekers can visit a WorkForce Center to look for a job, gain new work skills or meet with employers who are hiring. Workforce Solutions helps Ramsey County businesses stay successful by providing qualified workers. The 84 employees of Workforce Solutions provide employment and training services to businesses and job seekers in Ramsey County. 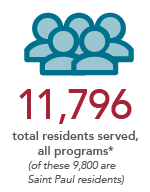 Services are free and made available through the economic development and public workforce system. * summarized by program year. ​WorkForce Centers offers one-on-one staff assistance and counseling, trainings, employer and educator events, technology access and other resources.